Chicago flower delivery has never been so easy!Your loved ones in Cook County, Illinois, will appreciate a Teleflora bouquet or gift basket for any occasion. There’s nothing quite like the surprise of receiving a gorgeous floral assortment. 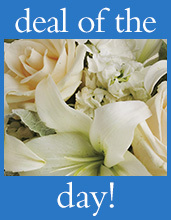 Your recipient will love the hand-arranged bouquet in a decorative vase, which arrives ready to be enjoyed. Every Teleflora bouquet is hand-delivered by a local Chicago florist. Whether you’re sending to a high-rise Lakeview apartment building or a house in the suburbs of Wilmette, your delivery will be handled with care and is sure to reach its destination safely. Unlike other floral delivery services, we won’t ship your delicate flowers in a box, at risk of damage or dehydration. Ordering from Teleflora is also a great way to support independent Chicago flower shops. In addition to residences, our florists deliver to all major Chicago hospitals, hotels, funeral homes and cemeteries. If you can’t be with your loved one at Rush University Hospital, send a “Get Well Soon” bouquet to let them know you care. Teleflora is a great choice for corporate gifts, too. Our modern arrangements would complement any office in the Chicago Loop. For beautiful Chicago flowers for any occasion, trust a local florist. Rest easy knowing your floral gift will arrive on time, at the peak of freshness.